Monoclonal Antibodies against Bacteria, Volume I explores the generation, characterization, and utilization of monoclonal antibodies against bacteria and on other monoclonal products relevant to antibacterial immune responses. 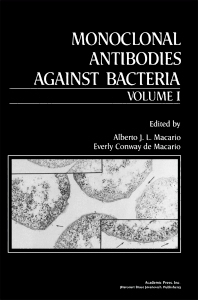 Organized into 12 chapters, this book begins with a discussion on monoclonal antibodies against bacteria, encompassing its scope, research, and directions. It shows that the coordinated use of antisera and panels of monoclonal antibodies is proving useful for classification as a diagnostic tool with prognostic implications in the case of pathogens, or as a preliminary step in taxonomy. Also, monoclonal antibodies hold great potential as instruments in working with bacteria for industrial or biotechnological purposes, including genetic engineering. This book also elucidates the use of monoclonal antibodies of predefined molecular specificity for tracing molecular ""signatures"" left by a given strain in other microorganisms, subcellular structures, and materials from ecologic niches. The possibility of antibacterial and antitoxin therapies with monoclonal antibodies is also addressed. This treatise will be a valuable reference work to anyone working with monoclonal antibodies or getting ready to prepare them against the strain(s) (or bacterial structures) of his/her interest.